Hyster is the leading global supplier of materials handling equipment, from 1t warehouse trucks to 52t container handlers. With a network of independent, experienced dealers providing sales & service support worldwide, Hyster delivers tailored, innovative, cost-effective solutions for a vast range of demanding applications. Hyster ReachStackers and Container Handlers, used to transfer and stack shipping containers in ports and terminals, are reported to offer significant savings in fuel costs thanks to the optimised powertrain configuration. By using Stage IIIA and Stage IV engines, which are combined with customised software also for transmission and hydraulics, this results in an efficient low fuel consumption powertrain specifically for container handling operations. Hyster equipment helps businesses to achieve greater efficiency and optimise port centric picking and packing operations. Our aim is to keep businesses moving and we have made a significant investment in developing some of the toughest and most reliable warehouse trucks on the market. While reliability is fundamental with regards to costs, throughput and driver productivity, other factors contribute to the ultimate goal of reducing the customer’s total cost of ownership, such as energy efficiency and truck performance. 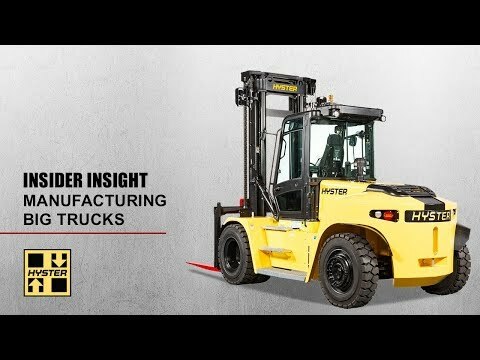 Once in operation, the fleet can be managed effectively with the new Hyster Tracker, a Wireless Access Monitoring System that helps keep tough Hyster forklift trucks running for even longer and even more productively. All Hyster products are supported worldwide by a network of highly trained dealers providing expert, responsive local service and a single point of contact for the full range of Hyster equipment used across the port area and hinterland. Hyster Europe is developing a zero-emission reachstacker featuring a hydrogen fuel cell for the Port of Valencia, which will be the first port in Europe to incorporate hydrogen energy in its operations. Hyster Europe customers will be able to cut emissions with the company's forthcoming EU Stage V compliant Big Truck range for European customers powered by Mercedes-Benz/ MTU engines. Visitors to the Greenport Congress from 16 to 19 October 2018 received an exclusive look at the Hyster zero emissions laden container handler currently in development. Hyster is developing a zero-emissions container handling truck powered by a Nuvera hydrogen fuel cell combined with a lithium-ion battery. Hyster Europe will be revealing new efficient developments to the energy recovery system of its 48t zero-emissions electric container handler at TOC Europe. Hyster will address fuel efficient handling and its benefits in ports at GreenPort Congress. Empty container handling trucks are lowering fuel consumption and emissions at a European carbon neutral container terminal. A project to electrify container handler trucks and 11t high capacity empty container handlers is underway at Hyster. Hyster says it’s poised to take the next giant leap forward in port equipment as it begins testing high capacity lift trucks with electric motors. Packing Center Hamburg (PCH) now uses the latest generation of Hyster® RS46-36CH ReachStackers, which meet the Stage IV/Tier 4 final emission standards, to transport containers on its premises in the Port of Hamburg. Hyster has introduced a new 5 to 8 high empty container handler, said to reduce fuel consumption by 25% compared to previous models and others in the industry. Hyster has upgraded its ‘green’ ReachStacker series to help ports and terminal experiencing increased container throughput further reduce costs and emissions. Hyster is expanding its range of indoor handling applications with a new “super tough powered” pallet track that is said to help save energy and reduce noise. The Port of Los Angeles (POLA) is reducing emissions with Hyster’s container handlers with Tier 4 Final engines – the first of the latest series to be delivered. 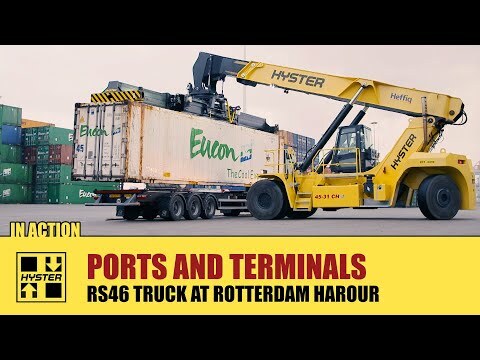 Five Hyster empty container handlers are helping Rotterdam Shortsea Terminals (RST) to load and unload ships more quickly and efficiently, saving the operator both time and money. Ports and terminals can reduce container handling and reachstacker fuel consumption by up to 25% just by choosing the right equipment, says Hyster. Equipment specialist Hyster has launched a range of Stage IV/Tier 4 final (T4f) compliant trucks for the port and terminal industry. Netherland’s based NACCO Materials handling group has won a Dutch environmental award for its efforts towards sustainability. Global equipment manufacturer, Hyster, part of NACCO Materials Handling Group (NMHG), has extended its ‘profitable low emissions’ approach to its new range of 8 to 16 tonnes lift capacity forklift trucks. Following the successful introduction of two new Hyster empty container handlers at the Port of Antwerp, port and logistics expert, Zuidnatie, has just invested in seven new low emission Hyster forklift trucks for its operations.